Everybody’s doing it. Even YouTube has succumbed to Twitter mania. 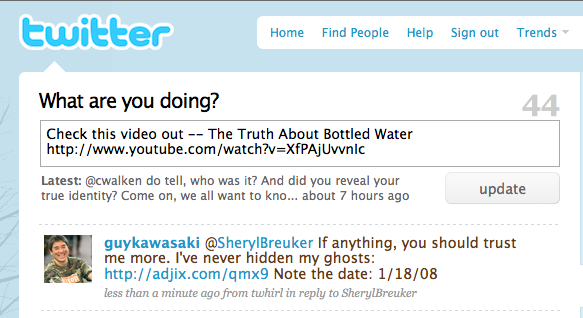 Below every video if you click on the “Share” link you will find three options: MySpace, Facebook, and now Twitter. You can expand the box for even more sharing options, but those are the main three and Twitter was just recently added. Clicking on the Twitter button opens a pop-up window that takes you to your Twitter account and fills in a Tweet telling your followers to “check out this video,” along with the title and URL. The URL is not shortened, but YouTube is working on that. (Youtube URLs are short anyway, so it is not a huge issue). Adding Twitter as one of the key sharing options is a no-brainer. Now, if they could actually embed the videos in the Twitter stream like you can on Facebook and MySpace, that would be something. YouTube announced some other tweaks today as well. The upload status bar is now fully rolled out. You can watch lectures and educational videos on YYouTube EDU, and it updated its mobile landing page and simplified the process of uploading a video from your phone to YouTube.